Traditionally, spirituality referred to a religious process of re-formation which "aims to recover the original shape of man",[note 2] oriented at "the image of God" as exemplified by the founders and sacred texts of the religions of the world. 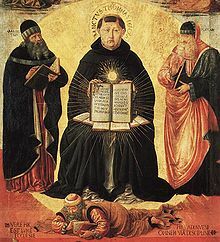 The term was used within early Christianity to refer to a life oriented toward the Holy Spirit and broadened during late medieval times to include mental aspects of life. 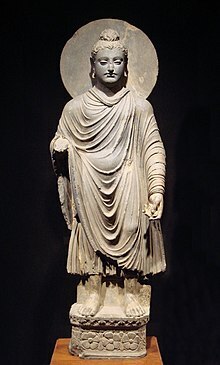 The influence of Asian traditions on western modern spirituality was also furthered by the perennial philosophy, whose main proponent Aldous Huxley was deeply influenced by Swami Vivekananda's Neo-Vedanta and universalism, and the spread of social welfare, education and mass travel after World War II. Among other factors, declining membership of organized religions and the growth of secularism in the western world have given rise to this broader view of spirituality. The term "spiritual" is now frequently used in contexts in which the term "religious" was formerly employed. Both theists and atheists have criticized this development. Rabbinic Judaism (or in some Christian traditions,[which?] Rabbinism) (Hebrew: "Yahadut Rabanit" – יהדות רבנית) has been the mainstream form of Judaism since the 6th century CE, after the codification of the Talmud. It is characterised by the belief that the Written Torah ("Law" or "Instruction") cannot be correctly interpreted without reference to the Oral Torah and by the voluminous literature specifying what behavior is sanctioned by the law (called halakha, "the way"). Judaism knows a variety of religious observances: ethical rules, prayers, religious clothing, holidays, shabbat, pilgrimages, Torah reading, dietary laws, etc. Kabbalah (literally "receiving"), is an esoteric method, discipline and school of thought of Judaism. Its definition varies according to the tradition and aims of those following it, from its religious origin as an integral part of Judaism, to its later Christian, New Age, or Occultist syncretic adaptations. Kabbalah is a set of esoteric teachings meant to explain the relationship between an unchanging, eternal and mysterious Ein Sof (no end) and the mortal and finite universe (his creation). While it is heavily used by some denominations,[which?] it is not a religious denomination in itself. Inside Judaism, it forms the foundations of mystical religious interpretation. Outside Judaism, its scriptures are read outside the traditional canons of organised religion. Kabbalah seeks to define the nature of the universe and the human being, the nature and purpose of existence, and various other ontological questions. It also presents methods to aid understanding of these concepts and to thereby attain spiritual realisation. The Pillars of Islam (arkan al-Islam; also arkan ad-din, "pillars of religion") are five basic acts in Islam, considered obligatory for all believers. The Quran presents them as a framework for worship and a sign of commitment to the faith. They are (1) the creed (shahadah), (2) daily prayers (salat), (3) almsgiving (zakah), (4) fasting during Ramadan and (5) the pilgrimage to Mecca (hajj) at least once-in-a-lifetime. The Shia and Sunni sects both agree on the essential details for the performance of these acts. Buddhist practices are known as Bhavana, which literally means "development" or "cultivating" or "producing" in the sense of "calling into existence." It is an important concept in Buddhist praxis (Patipatti). The word bhavana normally appears in conjunction with another word forming a compound phrase such as citta-bhavana (the development or cultivation of the heart/mind) or metta-bhavana (the development/cultivation of loving kindness). When used on its own bhavana signifies 'spiritual cultivation' generally. Jñāna marga is a path often assisted by a guru (teacher) in one's spiritual practice. Bhakti marga is a path of faith and devotion to deity or deities; the spiritual practice often includes chanting, singing and music – such as in kirtans – in front of idols, or images of one or more deity, or a devotional symbol of the holy. Karma marga is the path of one's work, where diligent practical work or vartta (Sanskrit: वार्त्ता, profession) becomes in itself a spiritual practice, and work in daily life is perfected as a form of spiritual liberation and not for its material rewards. Rāja marga is the path of cultivating necessary virtues, self-discipline, tapas (meditation), contemplation and self-reflection sometimes with isolation and renunciation of the world, to a pinnacle state called samādhi. This state of samādhi has been compared to peak experience. In some African contexts,[which?] spirituality is considered a belief system that guides the welfare of society and the people therein, and eradicates sources of unhappiness occasioned by evil. Not all modern notions of spirituality embrace transcendental ideas. Secular spirituality emphasizes humanistic ideas on moral character (qualities such as love, compassion, patience, tolerance, forgiveness, contentment, responsibility, harmony, and a concern for others). :22 These are aspects of life and human experience which go beyond a purely materialist view of the world without necessarily accepting belief in a supernatural reality or divine being. Nevertheless, many humanists (e.g. Bertrand Russell, Jean-Paul Sartre) who clearly value the non-material, communal and virtuous aspects of life reject this usage of the term spirituality as being overly-broad (i.e. it effectively amounts to saying "everything and anything that is good and virtuous is necessarily spiritual"). In 1930 Russell, a renowned atheist, wrote "... one's ego is no very large part of the world. The man [sic.] who can center his thoughts and hopes upon something transcending self can find a certain peace in the ordinary troubles of life which is impossible to the pure egoist." Similarly, Aristotle – one of the first known Western thinkers to demonstrate that morality, virtue and goodness can be derived without appealing to supernatural forces – even argued that "men create Gods in their own image" (not the other way around). Moreover, theistic and atheistic critics alike dismiss the need for the "secular spirituality" label on the basis that appears to be nothing more than obscurantism in that i) the term "spirit" is commonly taken as denoting the existence of unseen / otherworldly / life-giving forces and ii) words such as morality, philanthropy and humanism already efficiently and succinctly describe the prosocial-orientation and civility that the phrase secular spirituality is meant to convey but without risk of potential confusion that one is referring to something supernatural. Brooke has proposed that the currently held popular notion of antagonisms between science and religion has historically originated with "thinkers with a social or political axe to grind" rather than with the natural philosophers themselves. Though physical and biological scientists today see no need for supernatural explanations to describe reality[page needed][note 10], some[quantify] scientists continue to regard science and spirituality as complementary, not contradictory, and are willing to debate, rather than simply classifying spirituality and science as non-overlapping magisteria. Various studies (most originating from North America) have reported a positive correlation between spirituality and mental well-being in both healthy people and those encountering a range of physical illnesses or psychological disorders. Although spiritual individuals tend to be optimistic, report greater social support, and experience higher intrinsic meaning in life, strength, and inner peace, whether the correlation represents a causal link remains contentious. Both supporters and opponents of this claim agree that past statistical findings are difficult to interpret, in large part because of the ongoing disagreement over how spirituality should be defined and measured. There is also evidence that an agreeable / positive temperament and/or a tendency toward sociability (which all correlate with spirituality) might actually be the key psychological features that predispose people to subsequently adopt a spiritual orientation and that these characteristics, not spiritually per se, add to well-being. There is also some suggestion that the benefits associated with spirituality and religiosity might arise from being a member of a close-knit community. Social bonds available via secular sources (i.e., not unique to spirituality or faith-based groups) might just as effectively raise well-being. In sum, spirituality may not be the "active ingredient" (i.e. past association with psychological well-being measures might reflect a reverse causation or effects from other variables that correlate with spirituality), and that the effects of agreeableness, conscientiousness, or virtue – personality traits common in many non-spiritual people yet known to be slightly more common among the spiritual – may better account for spirituality's apparent correlation with mental health and social support. Masters and Spielmans conducted a meta-analysis of all the available and reputable research examining the effects of distant intercessory prayer. They found no discernible health effects from being prayed for by others. In fact, one large and scientifically rigorous study by Herbert Benson and colleagues revealed that intercessory prayer had no effect on recovery from cardiac arrest, but patients told people were praying for them actually had an increased risk of medical complications. Knowing others are praying for you could actually be medically detrimental. In the health-care professions there is growing[quantify] interest in "spiritual care", to complement the medical-technical approaches and to improve the outcomes of medical treatments. [need quotation to verify][page needed] Puchalski et al. argue for "compassionate systems of care" in a spiritual context. Neuroscientists have examined brain functioning during reported spiritual experiences finding that certain neurotransmitters and specific areas of the brain are involved. Moreover, experimenters have also successfully induced spiritual experiences in individuals by administering psychoactive agents known to elicit euphoria and perceptual distortions. Conversely, religiosity and spirituality can also be dampened by electromagnetic stimulation of the brain. These results have motivated some leading theorists to speculate that spirituality may be a benign subtype of psychosis (see). Benign in the sense that the same aberrant sensory perceptions that those suffering clinical psychoses evaluate as distressingly in-congruent and inexplicable are instead interpreted by spiritual individuals as positive – as personal and meaningful transcendent experiences. ^ a b Waaijman uses the word "omvorming", "to change the form". Different translations are possible: transformation, re-formation, trans-mutation. ^ In Dutch: "Zuiverheid van motieven, affecties, wilsintenties, innerlijke disposities, de psychologie van het geestelijk leven, de analyse van de gevoelens". ^ This reference gave rise to the distinguishing of two forms of jihad: "greater" and "lesser". 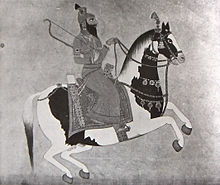 Some Islamic scholars dispute the authenticity of this reference and consider the meaning of jihad as a holy war to be more important. ^ George Feuerstein: "Yoga is not easy to define. In most general terms, the Sanskrit word yoga stands for spiritual discipline in Hinduism, Jainism, and certain schools of Buddhism. (...). Yoga is the equivalent of Christian mysticism, Moslem Sufism, or the Jewish Kabbalah. A spiritual practitioner is known as a yogin (if male) or a yogini (if female)." ^ a b c McCarroll 2005, p. 44. ^ a b c Koenig 2012, p. 36. ^ a b c Cobb 2012, p. 213. ^ a b Waaijman 2002. ^ a b Wong 2009. ^ a b c Gorsuch 1999. ^ a b Saucier 2006, p. 1259. ^ a b Sheldrake 2007, pp. 1–2. ^ a b Griffin 1988. ^ Jones, L.G., "A thirst for god or consumer spirituality? Cultivating disciplined practices of being engaged by god," in L. Gregory Jones and James J. Buckley eds., Spirituality and Social Embodiment, Oxford: Blackwell, 1997, 3–28 [4, n. 4]. ^ Waaijman 2000, pp. 359–60. ^ a b Waaijman 2000, p. 360. ^ a b Waaijman 2000, pp. 360–61. ^ a b c d e Waaijman 2000, p. 361. ^ Snyder 2007, pp. 261–61. ^ a b Sharf 1995. ^ McDermott, Robert (2007). The Essential Steiner. Lindisfarne. ISBN 978-1-58420-051-2. ^ Saucier 2007, p. 1259. ^ Paul Heelas, The New Age Movement: The Celebration of the Self and the Sacralization of Modernity. Oxford: Blackwell, 1996, p. 60. Cited in Anthony Giddens: Sociology. Cambridge: Polity, 2001, p. 554. ^ Michael Hogan (2010). The Culture of Our Thinking in Relation to Spirituality. Nova Science Publishers: New York. ^ Hollywood, Amy (Winter–Spring 2010). "Spiritual but Not Religious: The Vital Interplay between Submission and Freedom". Harvard Divinity Bulletin. Harvard Divinity School. 38 (1 and 2). Retrieved 4 January 2014. ^ David, Rabbi (2013-03-21). "Viewpoint: The Limitations of Being 'Spiritual but Not Religious'". Ideas.time.com. Retrieved 2014-01-04. ^ Hawting, Gerald R. (2000). The first dynasty of Islam: The Umayyad Caliphate AD 661–750. Routledge. ISBN 978-0-415-24073-4. See Google book search. ^ Ahmed Zarruq, Zaineb Istrabadi, Hamza Yusuf Hanson – "The Principles of Sufism". Amal Press. 2008. ^ An English translation of Ahmad ibn Ajiba's biography has been published by Fons Vitae. ^ a b Morgan, 2010 & 87. ^ "Jihad". Retrieved 20 February 2012. ^ a b "Jihad". BBC. 2009-08-03. ^ "Rhys Davids & Stede (1921–25), p. 503, entry for "Bhāvanā," retrieved 9 December 2008 from University Chicago". Dsal.uchicago.edu. Archived from the original on 2012-07-11. Retrieved 2014-01-04. ^ Mikel Burley (2000), Hatha-Yoga: Its context, theory and practice, Motilal Banarsidass Publications, ISBN 81-208-1706-0, pp. 97–98; Quote: "When, for example, in the Bhagavad-Gita Lord Krsna speaks of jnana-, bhakti- and karma-yoga, he is not talking about three entirely separate ways of carrying out one's spiritual practice, but, rather, about three aspects of the ideal life". ^ Nayar, Kamal Elizabeth & Sandhu, Jaswinder Singh (2007). The Socially Involved Renunciate – Guru Nanaks Discourse to Nath Yogi's. United States: State University of New York Press. p. 106. ISBN 978-0-7914-7950-6. ^ Kaur Singh; Nikky Guninder (2004). Hindu spirituality: Postclassical and modern. English: Motilal Banarsidass. p. 530. ISBN 978-81-208-1937-5. ^ Marwha, Sonali Bhatt (2006). Colors of Truth, Religion Self and Emotions. New Delhi: Concept Publishing Company. p. 205. ISBN 978-81-8069-268-0. ^ E. Marty, Martin & Appleby R. Scott (1996). Fundamentalisms and the State: Remaking Polities, Economies, and Militance. English: University of Chicago Press. p. 278. ISBN 978-0-226-50884-9. ^ Singh Gandhi, Surjit (2008). History of Sikh Gurus Retold: 1606–708. English: Atlantic Publishers & Distributors Pvt Ltd. pp. 676–77. ISBN 978-81-269-0857-8. ^ a b Mandair, Arvind-Pal Singh (October 22, 2009). Religion and the Specter of the West – Sikhism, India, Postcoloniality and the Politics of Translation. United States: University of Columbia. pp. 372 onwards. ISBN 978-0-231-14724-8. ^ Singh, Nirbhai (1990). Philosophy of Sikhism: Reality and Its Manifestations. New Delhi: South Asia Books. pp. 111–12. ^ Philpott, Chris (2011). Green Spirituality: One Answer to Global Environmental Problems and World Poverty. AuthorHouse. ISBN 978-1-4670-0528-9. ^ Singh Kalsi; Sewa Singh (2005). Sikhism. United States: Chelsea House Publishers. p. 49. ISBN 978-0-7910-8098-6. ^ Hayer, Tara (1988). "The Sikh Impact: Economic History of Sikhs in Canada" Volume 1. Surrey, Canada: Indo-Canadian Publishers. p. 14. ^ Lebron, Robyn (2012). Searching for Spiritual Unity...can There be Common Ground? : A Basic Internet Guide to Forty World Religions & Spiritual Practices. CrossBooks. p. 399. ISBN 978-1-4627-1261-8. ^ Singh, Nikky-Guninder (1993). The Feminine Principle in the Sikh Vision of the Transcendent. Cambridge University Press. p. 172. ISBN 978-0-521-43287-0. ^ Otterloo 2012, pp. 239–40. ^ Ewert Cousins, preface to Antoine Faivre and Jacob Needleman, Modern Esoteric Spirituality, Crossroad Publishing 1992. ^ a b Schuurmans-Stekhoven, J.B. (2011). "Is it God or just the data that moves in mysterious ways? How well-being research might be mistaking faith for virtue?". Social Indicators Research. 100 (2): 313–30. doi:10.1007/s11205-010-9630-7. ^ Bertrand Russell The conquest of happiness Horace Liveright Inc. 1930, p. 71. ^ Wilkinson, Tony (2007). The lost art of being happy : spirituality for sceptics. Findhorn Press. ISBN 978-1-84409-116-4. ^ Browner, Matthieu Ricard; translated by Jesse (2003). Happiness: A guide to developing life's most important skill (1st pbk. ed.). New York: Little Brown. ISBN 978-0-316-16725-3. ^ Ellison, Christopher G.; Daisy Fan (Sep 2008). "Daily Spiritual Experiences and Psychological Well-Being among US Adults". Social Indicators Research. 88 (2): 247–71. doi:10.1007/s11205-007-9187-2. JSTOR 27734699. ^ Schuurmans-Stekhoven, J.B. (2013). "As a shepherd divideth his sheep from the goats": Does the Daily Spiritual Experiences Scale encapsulate separable theistic and civility components?". Social Indicators Research. 110 (1): 131–46. doi:10.1007/s11205-011-9920-8. ^ Anonymous (2009). Alcoholics Anonymous: By the Anonymous Press. The Anonymous Press. pp. 14–15. ISBN 978-1-892959-16-4. Retrieved 5 March 2013. ^ a b Hori 1999, p. 47. ^ a b Waaijman 2000, pp. 644–45. ^ a b c Waaijman 2000, p. 645. ^ Seybold, Kevin S.; Peter C. Hill (Feb 2001). "The Role of Religion and Spirituality in Mental and Physical Health". Current Directions in Psychological Science. 10 (1): 21–24. doi:10.1111/1467-8721.00106. ^ Gascoigne, John (1988). Cambridge in the Age of the Enlightenment: Science, Religion and Politics. Cambridge: Cambridge University Press. p. 300. The 'holy alliance' between Newtonian natural philosophy and Anglican latitudinarianism had, by the end of the eighteenth century, proved a fruitful marriage. Confident assertions that science and religion were allies remained part of the intellectual landscape in the first half of the nineteenth century and natural theology continued to be one of the most influential vehicles for the dissemination of new scientific theories [...]. ^ a b Brooke, John Hedley (1991). Science and religion: some historical perspectives. Cambridge: Cambridge University Press. ^ Brooke, John Hedley (2014). Science and religion: some historical perspectives. The Cambridge History of Science series (reprint ed.). Cambridge: Cambridge University Press. p. 22. ISBN 978-1-107-66446-3. Retrieved 2018-03-03. ^ Brooke, John Hedley (2014). Science and religion: some historical perspectives. The Cambridge History of Science series (reprint ed.). Cambridge: Cambridge University Press. p. 18. ISBN 978-1-107-66446-3. Retrieved 2018-03-03. ^ Clarke, Steve. Naturalism, Science, and the Supernatural in Sophia From the issue entitled "Special APRA Issue" Volume 48, Number 2, 127–42, doi:10.1007/s11841-009-0099-2 "There is overwhelming agreement amongst naturalists that a naturalistic ontology should not allow for the possibility of supernatural entities." ^ Dawkins, Richard (1986). The Blind Watchmaker: Why the Evidence of Evolution Reveals a Universe without Design. W.W. Norton & Company (published 2015). ISBN 978-0-393-35309-9. Retrieved 2018-03-03. There is nothing supernatural, no 'life force' to rival the fundamental forces of physics. [...] My thesis will be that events that we commonly call miracles are not supernatural, but are part of a spectrum of more-or-less improbable natural events. ^ Stroud, Barry. (2004). "The charm of naturalism". In: M. De Caro & D. Macarthur (Eds. ), Naturalism in question (pp. 21–35). Cambridge, MA: Harvard University Press. "Most philosophers for at least one hundred years have been naturalists in the nonsupernaturalist sense. They have taken it for granted that any satisfactory account of how human belief and knowledge in general are possible will involve only processes and events of the intelligible natural world, without the intervention or reassurance of any supernatural agent." ^ Dalai Lama, The universe in a single atom: the convergence of science and spirituality. Broadway Books, 2006. ISBN 0-7679-2081-3. ^ Capra, Fritjof (1975). The Tao of Physics: an exploration of the parallels between modern physics and Eastern mysticism (1991 3rd ed.). Boston: Shambhala Publications. ISBN 978-0-87773-594-6. ^ Sheremer, Michael (2005). "Quantum Quackery". Scientific American. 292 (1): 34. Bibcode:2005SciAm.292a..34S. doi:10.1038/scientificamerican0105-34. ^ Joshanloo, Mohsen (4 December 2010). "Investigation of the Contribution of Spirituality and Religiousness to Hedonic and Eudaimonic Well-Being in Iranian Young Adults". Journal of Happiness Studies. 12 (6): 915–30. doi:10.1007/s10902-010-9236-4. ^ Fehring, R.J., Miller, J.F., Shaw, C. (1997). Spiritual well-being, religiosity, hope, depression, and other mood states in elderly people coping with cancer 24. Oncology Nursing Forum. pp. 663–71. ^ Nelson, C.J. ; Rosenfeld, B.; Breitbart, W.; Galietta, M. (2002). "Spirituality, religion, and depression in the terminally ill". Psychosomatics. 43 (3): 213–20. doi:10.1176/appi.psy.43.3.213. PMID 12075036. ^ Koenig, H.G. (2008) Research on religion, spirituality, and mental health: A review. Canadian Journal of Psychiatry. ^ Schuurmans-Stekhoven, J. B. (2019). "Conviction, character and coping: religiosity and personality are both uniquely associated with optimism and positive reappraising". Mental Health, Religion & Culture: 1-17. ^ Salsman, J.M. ; Brown, T.L. ; Brechting, E.H.; Carlson, C.R. (2005). "The link between religion and spirituality and psychological adjustment: The mediating role of optimism and social support". Personality and Social Psychology Bulletin. 31 (4): 522–35. doi:10.1177/0146167204271563. PMID 15743986. ^ Park, C (2005). "Religion as a meaning-making framework in coping with life stress". Journal of Social Issues. 61 (4): 707–29. doi:10.1111/j.1540-4560.2005.00428.x. ^ Hill, P.C. (1995). Affect theory and religious experience. In R.W. Hood, Jr (Ed.) Handbook of religious experience (pp.) Birmingham AL, Religious Education Press. ^ Schuurmans-Stekhoven, J.B. (2013b). "As a shepherd divideth his sheep from the goats": Does the Daily Spiritual Experiences Scale encapsulate separable theistic and civility components?". Social Indicators Research. 110 (1): 131–46. doi:10.1007/s11205-011-9920-8. ^ Emmons, R.A. (2005). Emotion and religion. In R.F. Paloutzian, & C.L. Park (Eds. ), Handbook of the psychology of religion and spirituality (pp. 235–52). New York: Guilford Press. ^ a b Schuurmans-Stekhoven, J.B. (2013a). "Is God's call more than audible? A preliminary exploration of a two-dimensional model of theistic/spiritual beliefs and experiences". Australian Journal of Psychology. 65 (3): 146–55. doi:10.1111/ajpy.12015. ^ Saroglou, V.; Buxant, C.; Tilquin, J. (2008). "Positive emotions as leading to religion and spirituality". Journal of Positive Psychology. 3 (3): 165–73. doi:10.1080/17439760801998737. ^ Schuurmans-Stekhoven, J.B. (2010). "Moved by the spirit". Does spirituality moderate the inter-relationships between Subjective Well-Being (SWB) subscales?". Journal of Clinical Psychology. 66 (7): 709–25. doi:10.1002/jclp.20694. PMID 20527052. ^ Saroglou, V (2010). "Religiousness as a cultural adaptation of basic traits: A five-factor model perspective". Personality and Social Psychology Review. 14 (1): 108–25. doi:10.1177/1088868309352322. PMID 20023209. ^ Saroglou, V (2002). "Religion and the five factors of personality: A meta-analytic review". Personality and Individual Differences. 32 (1): 15–25. doi:10.1016/s0191-8869(00)00233-6. ^ Gebauer, J.; Bleidorn, W.; Gosling, S.; Rentfrow, P.; Lamb, M.; Potter, J. (2014). "Cross-cultural variations in Big Five relationships with religiosity: A sociocultural motives perspective". Journal of Personality and Social Psychology. 107 (6): 1064–91. doi:10.1037/a0037683. PMID 25180757. ^ Löckenhoff, C.E. ; Ironson, G.H. ; O'Cleirigh, C.; Costa, P.T. (2009). "Five-Factor Model Personality Traits, Spirituality/Religiousness, and Mental Health Among People Living With HIV". Journal of Personality. 77 (5): 1411–36. doi:10.1111/j.1467-6494.2009.00587.x. PMC 2739880. PMID 19686457. ^ Masters, K.S. ; Spielmans, G.I (2007). "Prayer and health: review, meta-analysis, and research agenda". Journal of Behavioral Medicine. 30 (4): 329–38. CiteSeerX 10.1.1.462.3003. doi:10.1007/s10865-007-9106-7. PMID 17487575. ^ Benson; et al. (2006). "Study of the Therapeutic Effects of Intercessory Prayer (STEP) in cardiac bypass patients: A multicenter randomized trial of uncertainty and certainty of receiving intercessory prayer". American Heart Journal. 151 (4): 934–42. doi:10.1016/j.ahj.2005.05.028. PMID 16569567. ^ Kurup, R.K.; Kurup, P.A. (2003). "Hypothalamic digoxin, hemispheric chemical digoxin, and spirituality". International Journal of Neuroscience. 113 (3): 383–93. doi:10.1080/00207450390162155. ^ Necini, P., & Grant, K.A. (2010). Psychobiology of drug-induced religious experience: From the brain 'locus of religion' to cognitive unbinding. Substance Use & Misuse, 45(13), 2130–51. ^ Joseph, R. (2001). The limbic system and the soul: Evolution and the neuroanatomy of religious experience, Zygon, 36(1), 105–36. ^ Drevets, W.C.; Gautier, C.; Price, J.C.; Kupfer, D.J. ; Kinahan, P.E. ; Grace, A.A.; Price, J.L. ; Mathis, C.A. (2001). "Amphetamine-induced dopamine release in human ventral striatum correlates with euphoria". Biological Psychiatry. 49 (2): 81–96. doi:10.1016/s0006-3223(00)01038-6. PMID 11164755. ^ Claridge, G. (2010) Spiritual experience: Healthy psychoticism? In Clarke, I. (Ed), Psychosis and spirituality: Consolidating the new paradigm (pp. 75–86). Chester: Wiley-Blackwell. ^ a b Davies, M.F. ; Griffin, M.; Vice, S. (2001). "Affective reactions to auditory hallucinations in psychotic, evangelical and control groups" (PDF). British Journal of Clinical Psychology. 40 (4): 361–70. doi:10.1348/014466501163850. ^ Thalbourne, M.A. ; Delin, P.S. (1994). "A common thread underlying belief in the paranormal, creative personality, mystical experience and psychopathology". Journal of Parapsychology. 58: 3–38. Saucier, Gerard; Katarzyna Skrzypinska (1 October 2006). "Spiritual But Not Religious? Evidence for Two Independent Dispositions" (PDF). Journal of Personality. 74 (5): 1257–92. CiteSeerX 10.1.1.548.7658. doi:10.1111/j.1467-6494.2006.00409.x. JSTOR 27734699. PMID 16958702. Retrieved 2013-03-05. Schneiders, Sandra M. (1989). "Spirituality in the Academy". Theological Studies. 50 (4): 676–97. doi:10.1177/004056398905000403. ISSN 0040-5639. OCLC 556989066. Sheldrake, Philip (1998). Spirituality and history: Questions of interpretation and method. Maryknoll, NY: Orbis Books. ISBN 978-1-57075-203-2. OCLC 796958914. ^ a b "Online Etymology Dictionary, Spirit". Etymonline.com. Retrieved 2014-01-04. ^ "Online Etymology Dictionary, Spiritual". Etymonline.com. Retrieved 2014-01-04. ^ "Online Etymology Dictionary, Spirituality". Etymonline.com. Retrieved 2014-01-04. ^ "Stanford Encyclopedia of Philosophy, Transcendentalism". Plato.stanford.edu. Retrieved 2014-01-04. ^ a b c d Jone Johnson Lewis. "Jone John Lewis, What is Transcendentalism?". Transcendentalists.com. Retrieved 2014-01-04. ^ "Barry Andrews, The Roots Of Unitarian Universalist Spirituality In New England Transcendentalism ". Archive.uua.org. 1999-03-12. Archived from the original on 2013-09-21. Retrieved 2014-01-04. ^ "Frank Morales, Neo-Vedanta: The problem with Hindu Universalism". Bharatabharati.wordpress.com. 2012-02-15. Retrieved 2014-01-04. ^ "Gellman, Jerome, "Mysticism", The Stanford Encyclopedia of Philosophy (Summer 2011 Edition), Edward N. Zalta (ed.)". Plato.stanford.edu. Retrieved 2014-01-04. ^ "Robert H. Sharf, Whose Zen? Zen Nationalism Revisited" (PDF). Retrieved 2014-01-04. ^ "Hu Shih: Ch'an (Zen) Buddhism in China. Its History and Method". Thezensite.com. Retrieved 2014-01-04.